Three-dimensional design is an ever-expanding field, and can take a lifetime to explore and learn all of the subtle nuances between different programs and their applications and strengths. One commonality between the majority of design software is an intricate (and often cumbersome) interface with a variety of tools, views and navigation. As part of the evolution of these design programs, companies are constantly looking for ways to improve the ergonomics of their software to increase usability and create more effective workflows. One company, 3Dconnexion (a former subsidiary of Logitech), has taken an approach outside of the scope of the software to improve usability and allow for additional control during the modeling and surfacing processes. 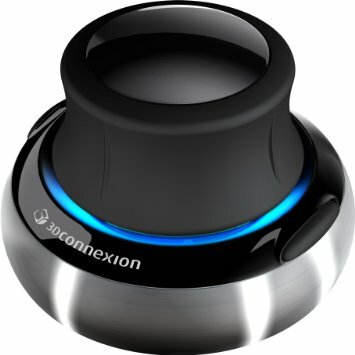 3Dconnexion’s 3D Mouse products were developed to provide easier and more effective manipulation of design software. The technology behind these mice has its roots in robotics and space exploration, with a predecessor 3D controller used on the space shuttle Columbia to control the first ever robotic arm in space. Their current line of SpacePilot™ Pro mice is a direct spawn of this technology, first introduced in April of 2009 with design intent in mind. By March of 2011, the company had already shipped over 1 million of these products across the world, to big-name clients such as Boeing, BMW, Honda, and General Motors. would not be as easily achieved with a traditional mouse, including tilts, spins and rolls. Having a separate mouse for the left hand takes much of the burden off of the right hand, increasing comfort and improving workflow performance. The company offers a variety of 3D mouse products of varying sizes and capabilities, from a smaller, simplified control device to larger, advanced devices with programmable features. To learn more, visit 3Dconnexion’s website.